Tadpole has the largest range of Easyrig and Flowcine products for hire in New Zealand with the knowledge and experience to guide you on your hire or purchase. NEW Easyrig Flow now available to order. A fantastic versatile Easyrig Flow is an upper section of an Easyrig arm system that covers both Gimbal operating plus camera only for Easyrig hand holding. 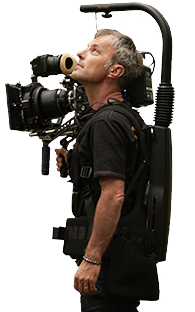 If an existing Easyrig owner you can buy just the rear Vario 5 Strong Power Pack with Easyrig FLOW and use your existing vest. This is suited for Gimbalrig vests. Tired of losing your Serene bungee ? Where to put your Easyrig between set ups? This is an Arri Maxima, one of the very best , strongest Gimbals made. Note footsteps are visible in the shot and he is walking gently. Vario 5 std arm is same height as a std Cinema 3 arm ( 600mm lower section length) so here they have the Double Length Centre Post ( note the 2 x rubber bellows covering it) to get same height as a Gimbalrig Arm ( Lower section 800mm) so they can run the gimbal closer to eye level. Still can notice footsteps albeit very slightly less. Std height Vario 5 with the Serene. Here he says he’d like it higher still so he’d prefer to add back on the double length centre post . However for most gimbals that are not as large as the maxima this set up works fine. Note , now no footsteps visible ..no z axis movement. He is walking the same etc. This is what Serene does. Overall it shows the gimbals can not counter z axis movement when on Easyrig only. This is because Easyrig is a support system - designed to take the weight , Serene is for dampening.